For those who are reading this and have either gone through a depressive episode or are being treated for depression I'm sure you 'get it'. When I say 'get it' I mean what it's like to not want to get out of bed in the morning because you don't have the will to get up (I have young children so not getting out of bed isn't an option); not sleeping well at night (being up for a couple hours in the middle of the night or having broken sleep); having what seems like no short term memory (asking your spouse the same question four times in a row for example) or no ability to mentally focus on anything beyond the basics (reading a book can be extremely mentally challenging or doing basic math and I can't tell you how many recipes I've screwed up that I normally could do blindfolded before I became ill). My spirits in general are up in that I smile but my 'zest for life' isn't there. I used to be super vigilant about working out 5 - 6x a week and now I'm lucky if I get two workouts in and they are less than 100% in the effort scale (on the upside the endorphin's during cardio is when I feel the most normal); eating is all over the map for me - I'm either chowing down on high carbs, eating really well or I don't eat because I feel nauseous. Unfortunately because I haven't been exercising like I normally do I'm gaining some weight : ( . Fortunately depression isn't 100% all bad all the time. I have moments where I feel really good aka normal and I start making plans for things I want to do or I go out and do something and I enjoy every minute of it... and then I crash ( feeling tired and hopeless) and then I'm reminded that depression has its ups and downs and to make long term plans to be set in stone right now isn't in my best interest. I'm hoping with the help of some medication tweaking, more talk therapy and time I will be 100% back to normal in 9 - 12 months. How did I get 'here'? I pushed myself too hard for too long to my breaking point. Things really started to snowball in October. I was training for the Philadelphia marathon and taking 6 credits (one of those was Exercise Physiology - and putting the pressure on myself to get all A's) in addition to being a stay at home mom to two young boys. Mixed in with that are other stressors such as the death of a babysitter, losing power for 5 days (while trying to study for an exam and having my kids out of school for a few days), having a parent recovering from a stroke and finding out my childhood home was condemned. In addition to the above mentioned earlier this year I sought out to find the person who abused me when I was 5. It was a neighbor who abused me for 1.5 years. I found him through the internet in August-Sept. but it ended up that he died last year as I found his death certificate. I was hoping to find him to confront him in some way and get closure. That's a subject for another post. In September when school started I slowly started shutting out friends and social engagements to study harder and longer outside of my running/exercise. I stopped going to the grocery store for it would take too much time away from studying. I tend to be very methodical and focused (perfectionist and somewhat obsessive) when I set a goal which is good and bad. There has to be a balance. I was slowly falling into a depression. One of the symptoms of depression is inability to focus. I was spending more time on my school work and yet not getting as much work done. When it came to my studies my comprehension seemed to be suffering so to compensate I just pushed myself even harder. All of this was the 'perfect storm' which lead to feelings of not caring about anything anymore and not wanting to be here anymore. When I first started having thoughts of self harm I pushed them aside and ignored them. After about a week of having them I broke down and told someone because I didn't know if I had it in me to fight off the feelings and wanting to give into them. I'm thankful to have had that person I could confide in. Initially I didn't even share this with my husband as I was afraid of scaring him but have since realized he is there for me to lean on and is a huge support for me. One of the things I was asked at the hospital was what would keep me from harming myself? My answer: "My children. I could never leave them." I look at them smile and say to myself "How could I leave them? I could never give up those hugs." I love my children and would do anything for them. The thing I most feared was losing control of myself and not being around for my children. I know that when people do harmful things to themselves that the average person wouldn't do it is because they are ill and there mind 'takes over' and there is a loss of control. Loss of control is what I was afraid of. What is it like for me living with depression and anxiety? My symptoms vary from day to day with depression and anxiety (also vary by individual). In general I feel fatigued and disinterested in life in general (symptoms of depression). I have spurts of energy and that's when I feel the urge to get out of the house and meet up with a friend. If I go out in the evening I have to take a nap during the afternoon or there is no way I'll have the energy to go out. If I go out in the morning or afternoon it feels like I need a nap afterwords. It sounds kind of pathetic but my life has been reduced to doing the bare basics such as helping/spending time with my kids (doing the best I can), cooking a meal, and possibly getting a workout in or doing a household chore like grocery shopping. Anything beyond that for me right now feels exhausting and overwhelming. On the subject of sleeping at night I take something right before bed that has a side effect of knocking one out and staying asleep for hours (If I didn't take that I wouldn't be getting any sleep) so I am getting plenty of rest. When it comes to anxiety it comes and goes. Sometimes I feel anxious about my future and how soon can I 'get back to normal' or I feel anxious around certain objects like wearing a certain necklace for example. Other times I have anxiety that seemingly comes from out of nowhere and I have a tightness in my chest or what feels like a shortness of breath that lasts for a few seconds to a few minutes. I will be done with my outpatient program at the end of this week and my plans are to take the spring semester off from school and try and set the bar of achievement really low. I plan on getting back to a more normal workout routine and getting back to 5 workouts a week instead of just doing my now 2 workouts per week. For treatment I'll be seeing a therapist in addition to a psychiatrist (talk therapy/CBT and medication is the best form of treatment for depression and anxiety vs. just one or the other). I will work on continuing to be a good mom to my boys. I will accept what I can and can't do on any given day (that is going to be a difficult pill to swallow). I will get some meditation in every day. I wish to learn how to ice skate this winter by taking lessons with my boys. I wish to be regular with my exercise: running, weights, spin and yoga. I wish to maintain some level of being social. I wish to accomplish at least one thing a day around the house. Long term wish list for 2013. Run a few more 5k's and maybe a half marathon. Take a few vacations - one with friends and one with family. How can you support a friend or family member who has this illness? Unfortunately depression isn't something a person can just 'snap out of'. If you are dealing with depression I hope you heal quickly. In closing I wanted to share with you something my husband did for me the other day. He made me a cup of tea and on the mug it read: "Courage does not roar. 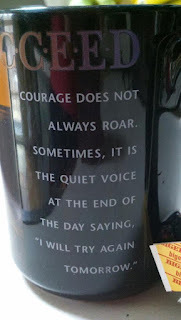 Sometimes, it is the quiet voice at the end of the day saying, "I will try again tomorrow." I will try again tomorrow no matter what. Thanks so much for opening up! I was actually thinking about your blog the other day and wondering how you were doing. I'm glad to hear that you are getting help and that you're on the road to recovery. Prayers for you and your family. Happy New Year. Thank you so much Danielle for your prayers and kind words. I was thinking about you. I miss connecting with people on my blog. Blessings to you and your family. Love you honey! That was a very brave thing to do and I'm beyond happy that you got the help you needed! Big hugs whenever you need them! Thank you so much Jen! So thankful for everyone's support. Have a great 2013! Sonya - always here for you!!!! This was amazing therapy in itself writing this!!!! Hugs!!! Jersey! Thank you Jersey ;-) I am lucky to have great support! I am inspired by your words and your courage! I'm still learning...and a bit nervous about adding the rest of the story. I thought it would be anonymous though?? How did you know about it? Your SWG links to your blog so whenever you leave a comment on a person's blog people can click on your name to see your blog :-) Keep writing!!!! It's a great way to connect with people even if only virtually.